This is another pattern by Tanis Lavallee that I had in my mind for a while. I guess I was just waiting for a baby girl to be born to knit it. 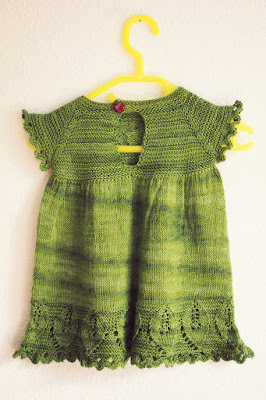 At first I wasn't sure what size to do, I wanted a dress for a girl between 6 and 12 months but my yarn was quite a bit thinner than the yarn in the original pattern so I cast on for the biggest size. 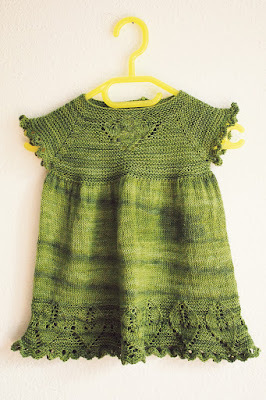 Now it seems that I could have gone one size down as well but I guess it doesn't really matter that much because babies all grow into clothes eventually. I enjoyed both lace sections of this little dress. They were lovely to knit, not too complicated but interesting and somehow fast moving. The stockinette part was rather long and slightly boring, so I was glad when I was done with it. The end of the pattern brought a new technique for me (and I am not sure if I really knit it correctly but it looks nice) - the Scalloped Eyelet Cast Off. I found it rather fiddly but I think it's worth it because it makes for such a nice end at the sleeves and at the bottom. I am not totally sold on this yarn, I think the darker parts look a bit untidy but I hope they'll be hidden a bit when the dress is worn. The good surprise was that one single skein was enough to knit the whole dress with it. 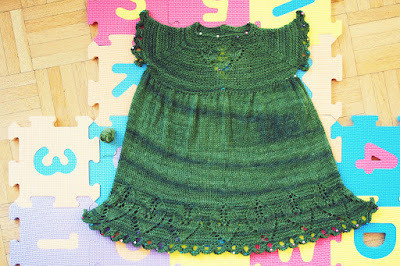 There is only a tiny little bit of leftover (2gr - you can see it next to the pinned dress on the left).